In celebration of their 25th season, The St. Paul Saints (independent; American Association) have unveiled commemorative Pig’s Eye uniforms. The uniforms will be worn during select home games this season. The top of the uniform combines the colors from two different decades of Saints baseball. The body of the jersey is in the “Saints Blue,” which the team wore from 2003-14 at Midway Stadium. The jersey sleeves are highlighted by a black and white stripe combination reminiscent of the team’s uniforms from 1993-2002. Across the chest of the uniform will appear “PIGS EYE” representing the historical connection between St. Paul and one of the first settlers to live within the borders of what would eventually become Minnesota’s capital city, Pierre “Pig’s Eye” Parrant. Before being renamed St. Paul, the area was known as Pig’s Eye Landing for the tavern opened by Parrant in the early 1800s. The Pig’s Eye lettering across the chest appears in a font inspired by the Lowertown arts community that is home to CHS Field and features a dot in the “P” representing the pig’s eye. The uniform numbers will be silver in celebration of the 25th season and will appear just below the “EYE” on the front left side of the jersey and on the back just below the nameplate. The “Pig’s Eye” uniform will include white pants with the same black and white stripe combination, down the side of each leg, which can be found on the trim of the jersey. The pants will be highlighted with a silver belt. The cap will be Saints Blue with a silver brim and button. It will feature the Pig’s Eye logo, in which the body of the pig is formed by the letters “STP” and the eye is dotted in the “P.” The design of the “STP” pig logo was created last season for use in the All-Star Game logo and was created by Minneapolis based design and brand agency, Imagehaus. 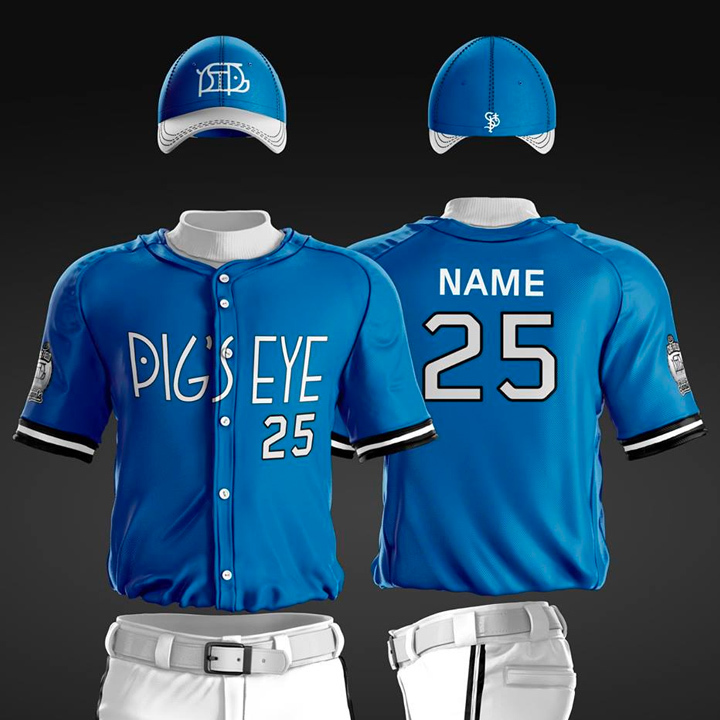 The “Pigs’ Eye” jersey will be worn on special 25th Anniversary Celebration games throughout the season, which will be announced at a later date. There will also be future announcements regarding special visits and giveaways as part of the 25-year festivities.